285 Penmaen Dewi historic landscape character area occupies the extreme western point of the St David's peninsula. 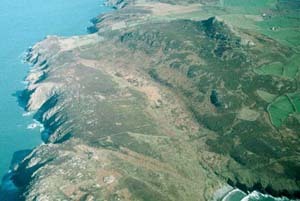 It comprises high sea cliffs backed by open moorland to the summit of Carn Llidi at 180m. 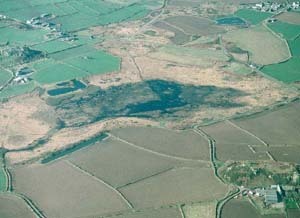 Prehistoric remains, including a promontory fort, chambered tombs and field systems lie on the moorland. 286 Porthmawr historic landscape character area is a treeless landscape of dispersed farms and fields. Dry-stone walls are the main type of field boundary. Hedges are few, and where present are low and windswept. Improved pasture is the main land-use. Camp sites and caravan parks are present. Paired farms situated on the south-facing slopes of Carn Llidi are a feature of this landscape. A wide range of dwelling type is present. Stone is the traditional building material. 287 Tywyn historic landscape character area comprises an area of wind-blown sand inland of Whitesands Bay. It was common land until enclosed by an Act of Parliament in 1869. Inland of a dune system close to the coast, the blown-sand is covered with grass. 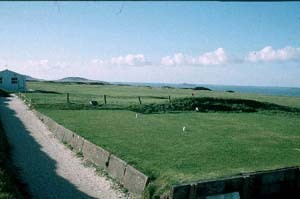 A golf course, hotel, modern houses, car park and other tourist facilities are situated in this area. 288 Treleddyd - Tretio - Caerfarchell historic landscape character area lies on rich farmland on the northern side of the St David's peninsula. It consists of fields, compact hamlets and dispersed farms. Dwellings are traditionally stone-built and range in date and style from sub-medieval houses and Georgian houses to 19th century cottages. Large, modern agricultural buildings are a strong element of the landscape. Field boundary banks are topped with low, windswept hedges. Camp sites and caravan parks are present, but land-use is predominantly improved pasture with some arable. It is a treeless landscape. 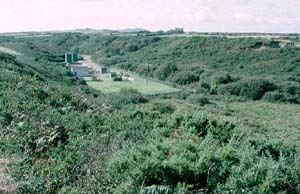 289 Treleddyn - Treginnis historic landscape character area lies on the western fringes of the St David's peninsula. 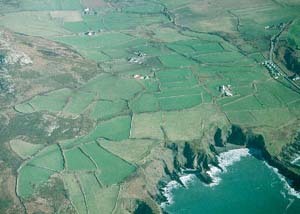 It comprises high sea cliffs and an agricultural landscape of small fields, tor-like rocky outcrops and scattered farms. 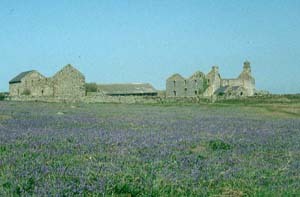 Farms are clustered in groups which shelter in the lee of the tors. Buildings are traditionally stone-built and range from sub-medieval houses and Georgian houses to 19th century cottages. 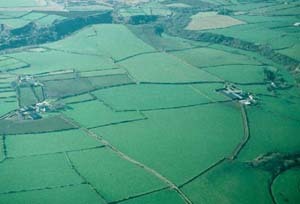 Land-use is a mixture of pasture, arable and rough grazing. It is a treeless landscape. Camp sites and caravan parks are present. 290 Pwll Trefeiddan historic landscape character area consists of unenclosed wet common with tracts of standing water. 291 Dyffryn Alun historic landscape character area consists of a narrow, scrub covered, steep-sided valley. The valley bottom is pasture or marsh. Hedges on the boundary banks in the valley bottom are neglected and redundant. A sewage works is located here. 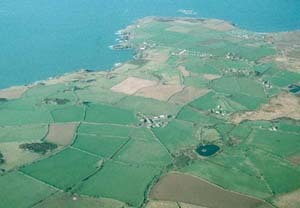 292 St Nons - Llandrudion historic landscape character area lies along the southern fringe of the St David's peninsula. 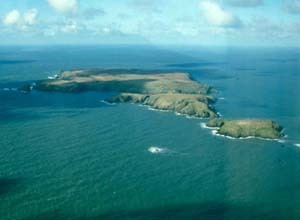 It includes high sea cliffs, inland of which lies a landscape of small fields and dispersed farms. Traditionally, buildings are stone-built, with most houses dating to the 19th century. There are several camp sites and caravan parks in the area, but the predominant land-use is pasture with some arable land. Hedges, where they survive on the earth and stone boundary banks, are low and windswept. It is a treeless landscape. 293 Comin: Dowrog - Treleddyd - Tretio historic landscape character area consists of wet and marshy common land. 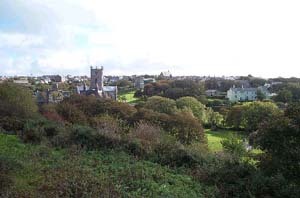 294 Tyddewi historic landscape character area consists of the city of St David's. It includes the cathedral close - St David's Cathedral, the old Bishop's Palace and associated buildings - the core of the medieval city and modern development on the outskirts. Buildings are traditionally stone-built. Outside the cathedral close, there is a large variety in building types, but most buildings date to the 19th- and 20th-century. 295 Warpool historic landscape character lies across the former open fields surrounding St David's City. 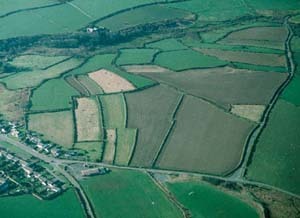 Narrow strip-fields enclosed by banks and low hedges characterise this area. These strips have been encroached on by 19th- and 20th-century development on the edge of the city. 296 St David's airfield historic landscape character area consists of an open landscape of restored pasture. 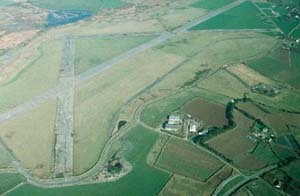 No buildings of the second world war airfield remain, but short sections of concrete runway and service roads survive. 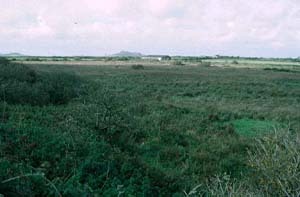 297 Waun Caerfarchell historic landscape character area comprises wet and marshy common land. 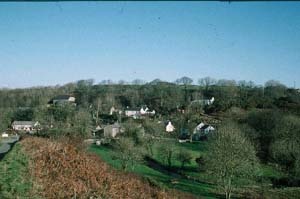 298 Middle Mill historic landscape character area lies in the narrow, steep-sided valley of the Solva River and is centred on a hamlet - Middle Mill. Traditional building material is stone, with most dwellings dating to the 19th century, but with a scattering of 20th century houses. A large abandoned quarry lies on the valley side above the hamlet. Land-use consists of pasture on the valley bottom and woodland and scrub on the valley sides. 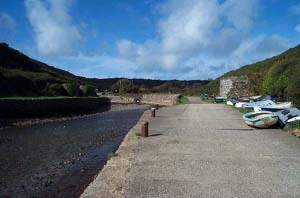 300 Porth Clais historic landscape character area includes a small stone-built harbour, quays, limekilns and car parks located in a narrow, steep-sided inlet. 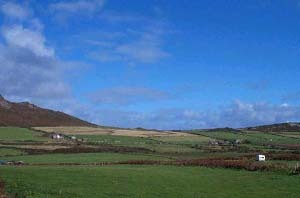 301 Caer Llundain - Caer Ysgubor historic landscape character area comprises the hilly and craggy open moorland part of Ramsey Island, bounded on three sides by high sea cliffs. 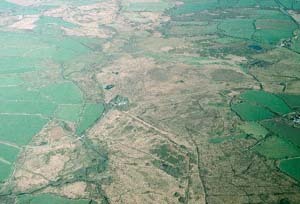 Remains of prehistoric field boundaries are found in this area. It is treeless landscape. 302 Ramsey historic landscape character area is the sheltered, northeast part of Ramsey Island which has been divided into large fields by dry-stone walls. It includes a19th century farm and a landing place. The land is mostly under pasture. It is a treeless landscape. 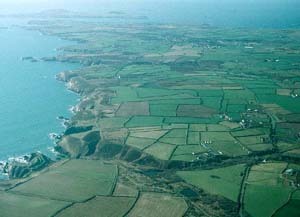 303 Ynys Selyf - Old Farm historic landscape character area lies in the centre of Skomer Island and consists of that part of the island farmed in the 18th- and 19th-century. The land is not now farmed, but the walls and banks of the fields and the old farmstead survive. 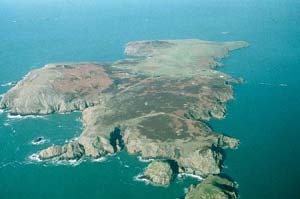 304 Ynys Selyf - prehistoric fields historic landscape character area comprises all of Skomer Island not cultivated in the 18th- and 19th-century. 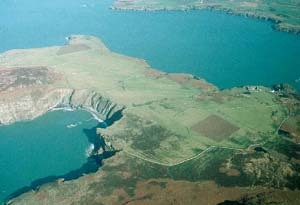 High sea cliffs surround a plateau on which the remains of prehistoric fields and settlements survive as low earthworks and walls. It is treeless landscape. Heavy grazing by rabbits maintains short grass over much of the island.